This is a painting expressing the importance of prayer, time with God. This is why Mary chose the seashore for the setting, a man in common clothing and the Lord looking over him listening to him. The bible says the strong man knows true strength comes from the Lord, that it not a sign of weakness. The bible and history show that kings, presidents, priests, ministers, women, children and old people pray to God. 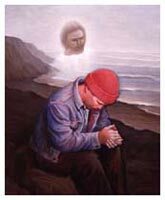 Man in Prayer Card 5" x 7"
In this painting Mary wants to remind people of God's great love for us. She chose passages from the bible to guide her in how to best express this in a painting. Illustrating a woman sitting on a bench with her face down to express the pain of despair that we go through at times in life. With the Lord behind her, His hand on her shoulder showing His omnipresence. Even when it seems as if the Lord is far away from us, no matter how dark or distressing this time in our lives may be, there is no burden too great that His love cannot penetrate. She felt the need to paint His face to express this love toward us. 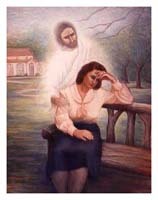 The Comforter Card 5" x 7"
In this painting Mary wanted to encourage people in their walk with the Lord. 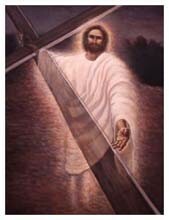 She painted the Lord strong holding up a rugged cross with one hand and making the cross transparent to show that in the hands of our Lord, our trials of today can be made light and we can have victory in this life. His other hand is extended toward us to say He wants us to come to Him with our lives. The scars on His hands are to remind us of the price he paid for our sins. Burden Made Light Card 5" x 7"
This painting shows the backs of two children carrying Bibles and walking towards the light. 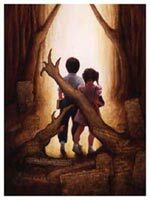 Mary placed dark trees around them with branches and roots reaching up with claw-like appendages. Below the children she placed newspaper clippings with headlines such as Two accused of bringing guns to school, Heavy metal Band sued in Teenagers Suicide, and Arrest Rate For Youths Soars in S.F, showing that these are the things that keep kids down; but, if they walk towards the light and read the Bible, the darkness won't be able to get them. They will be able to see clearly the light is the Lord and the darkness is sin. Journey Card 5" x 7"
In this painting Mary placed a teenager standing with his back to the viewer, holding a Bible. 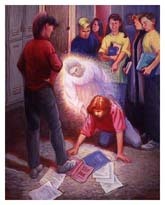 Next to him she placed a glowing image of Jesus with His arm around the teen whose eyes are fixed on the Lord. In the darkness below, other teenagers reach up with chains and shackles around their wrists, holding beer cans and smoking cigarettes reaching up wanting him to join them, they are slaves to sin their eyes are dark because their end is death. With this painting she wanted to direct people to Jesus. His way is full of light and if you're willing, He will give you a new life. His arm is around the boy to guide him. The reason Mary chose to use a teenager in this painting is because of the peer pressure that young people face. They are so vulnerable they don't realize that the decisions they make now can affect them for the rest of their lives. This message is for all of us. 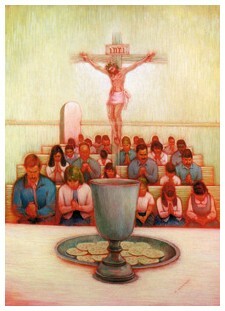 Jesus is the Way Card 5" x 7"
In this painting Mary wanted to emphasize the friendship of Jesus. She wanted to show that He�s a friend who is present all the time (Psalms 139:8). A friend who cares about the pain and struggles we go through. 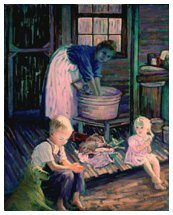 Mary painted a girl down on the ground, her books scattered, a teenager�s foot on one of her books and others laughing at her and Jesus behind her to say there is hope for the hurting. Jesus is a friend who loves us as we are we don�t have to be smart, gifted, talented, good looking, rich or popular. His love can�t be bought or earned it was paid for at the cross. His offer is a gift but we need to believe in Him. We are not to think it strange when we are treated unkindly for being Christians. �All things work together for good to them that love God and to them that are called according His purpose.� Romans 8:28 We are called to walk in the light as He is in the light. She painted Jesus transparent because although we can't see Him, He's present and placed Him behind the girl helping her up, He's our help and strength a faithful friend. 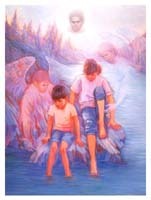 Jesus is a Friend Card 5" x 7"
In this painting Mary chose to use very light pastel colors and placed a girl and a boy on a rock in a lake with their feet dipping into the water and angels about them. 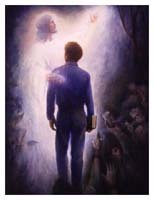 The angels were painted transparent with wings and strong arms because the angels mentioned in the Bible are mighty servants of God, able to protect us, win wars, deliver messages from God and fight spiritual battles, which we can�t see. Servants of the Lord Card 5" x 7"
Mary chose cool colors to express the time of day early in the morning. She wanted the boy's face to be seen as peace. This peace doesn't depend on circumstances it is given to us through a relationship with God through Jesus Christ. Image size 20" x 24.5"""
In this painting, Mary wanted to remind people of Gods great love and the sacrifice made at the cross for us. She painted a suffering Christ, which is seen in His face, hands and body. In John it says He was flogged with a lead-tipped whip, a crown of long sharp thorns was put on His head, they mocked Him, beat Him with a stick and then nailed Him to the cross. Mary placed light around Jesus because He is the light of the world, made Him transparent because He is risen; She painted the men, women and children in this painting praying, to remind us to examine our hearts.